Well circumscribed: Macroscopically, infratentorial ependymomas are gray, well-circumscribed tumors originating from the floor of the fourth ventricle. 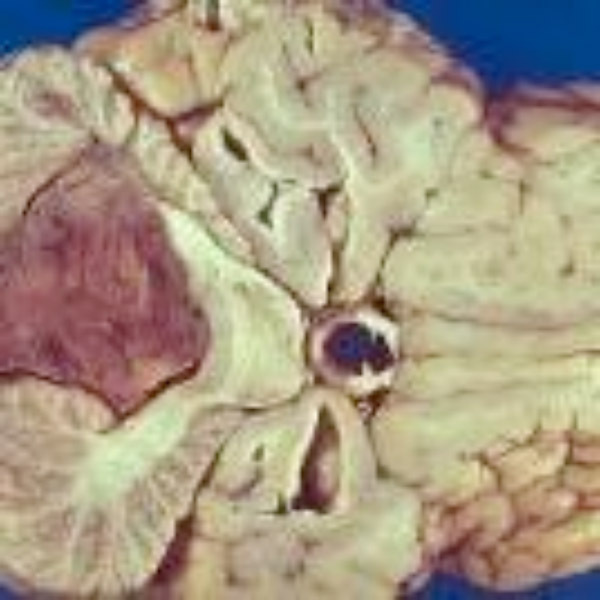 They are localized tumors with a tendency to invade the surrounding neural tissue and can also present with leptomeningeal spread at the time of diagnosis or recurrence. Macroscopic features of infratentorial ependymomas: Axial slice of the fixed brain shows a posterior fossa mass arising from the floor of the fourth ventricle and filling the fourth ventricle. Originate from the floor of the fourth ventricle: The tumor most commonly arises from the floor of the fourth ventricle at the inferior triangle; sometimes it originates from the cerebellopontine angle or other anatomical regions within the fourth ventricle. Noninfiltrative growth: The growth pattern of infratentorial ependymomas is noninfiltrative with a sharp margin between the tumor and surrounding tissues. W.H.O. grades 1 through 4: Ependymal tumors are classified according to the W.H.O. classification as subependymoma and myxopapillary ependymoma (grade 1), ependymoma (grade 2), malignant ependymoma (grade 3, and ependymoblastoma (grade 4). Five variants of infratentorial ependymomas histologically: Five variants of ependymoma include cellular, epithelial, papillary, tanycytic, and clear cell. These variants can be recognized in one pathological specimen simultaneously. Cellular and epithelial variants most common: Cellular (or glial) infratentorial ependymomas consist of perivascular pseudorosettes, whereas epithelial infratentorial ependymomas have true rosettes, reflecting the cell’s origin from the ventricular lining. 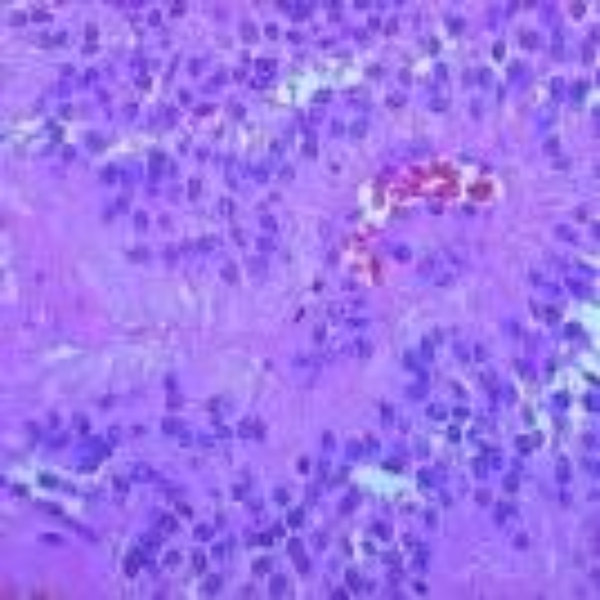 Microscopic features of celluar ependymoma: The microscopic appearance reveals a rosette pattern with the cells arranged around a central vascular space. Cysts, calcification, hemorrhage: Regardless of histological pattern, infratentorial ependymomas frequently have small cysts, necrosis, acute or chronic hemorrhage, and calcification. Microcalcification is identified in more than half of infratentorial infratentorial ependymomas (7). Ependymoblastoma: This lesion is known as an embryonal PNET and is usually located in the supratentorial compartment of young children. It is composed of poorly differentiated cells with frequent mitoses, and affected children have low survival rates (8).